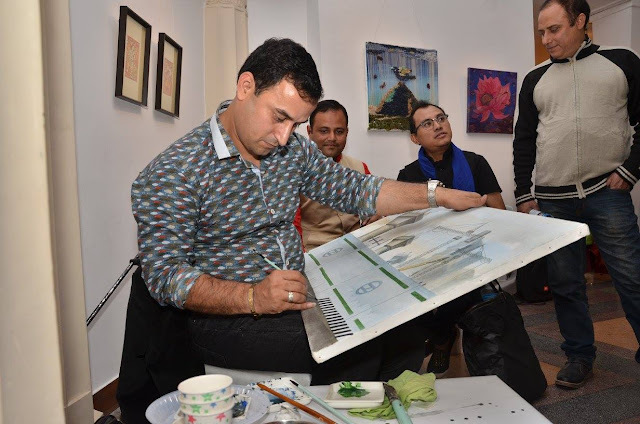 "Masters: Past, Present and Future 17& 18 February 2017 at Hungarian Information and Cultural Centre"
Life of Vision Foundation founder Sumita Dass associated with Gallery Sree Arts Mr. Jitender Padam Jain MD organized a group exhibition "Masters: Past, Present and Future on 17 & 18 February 2017 at Hungarian Information and Cultural Centre. The event was inaugurated by Mr. Mohsin Khan MD Prime News , Kapil Agarwal Advisor AMR, Dr. Zoltan Wilhelm Director at Balassi Intézet Mrs. Ratan Kaul Public Diplomat ,V P Indian Council of UN Relations, Dr Suvrokamal Dutta Political, Economic and Foreign Policy Expert , Anurudh Lal General Secretary at Delhi Pradesh Congress Committee, Mrs. Maya Singh Mrs. Universe CA , Mr. Vijay Tiwari President Indo European Chamber of small & medium Enterprises ,Actor Shiva to name the few. The exhibition was unique in itself as it amalgamates the creativity of the masters gone by, present masters and the hopeful masters of tomorrow for the first time to encourage art to showcase the myriad shades of the rich artistic & cultural heritage of the artists. To pursue the objective of cultural inter-linkages amongst different countries on cultural relation between India and Hungary there was live painting presentation by Rohit Sharma (India) and Natalia Bahushevich (Belarus). Also Sreelements (band of students of JJ Sanskriti School of Visual Arts, Gurugram) performed simultaneously.